Formed 1896. Wound up 1901. Elected to Division Two 1898. Resigned 1901. New Brighton emerged in the late nineteenth century as a popular coastal resort on the north-east corner of the Wirral for day trippers from Liverpool and Manchester. 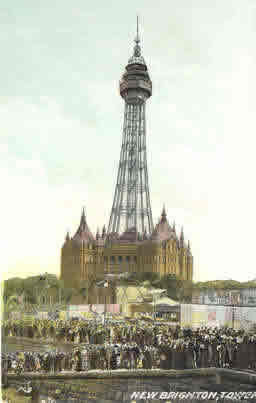 In 1896 work started on an observation tower which, when it was completed in 1900, stood 189.3 metres (621 feet) high, taller than the one built at Blackpool. The consortium behind this attraction conceived the idea of building a stadium adjacent to the tower and forming a professional football team to attract visitors during the slack winter months. Cash was poured into the fledgeling club and several former international players were signed, leading to the side being referred to as the Team of Internationals. More commonly they were known as "The Towerites." Tower's application to join the League was initially rejected but then it was decided to extend Division Two with four additional places and New Brighton were invited to fill one of the vacancies. The club played creditably in their three seasons of competition, narrowly missing out on promotion. Despite this the anticipated crowds failed to materialise, no doubt preferring to support their successful local sides, which included Everton, Liverpool, Newton Heath and Manchester City. On average only 1,000 spectators watched their home matches in a stadium with room for 8,000 and the consortium was losing money hand over fist. In September 1901, despite having finished fourth the previous season, the directors decided to resign from the League and wind up the club. Their place was offered to Doncaster Rovers. The Tower itself was demolished after the First World War. In 1921 a new club, New Brighton FC was formed and in 1923, they were elected to the League.